Lowell’s 1st floor view into the “Heart of the Market”…head up to our 2nd floor booths one flight up for the best people watching spot in Seattle! Lowell’s looks like a little coffee shop & diner when looking into all of our 6 doors. These are our southernmost doors that open into the “Heart of the Market” and are at the base of our stairs leading up to our “hideaway bar” on our second floor, and even further up to our third floor dining room! With all three floors viewing over the waterfront with wall to wall windows, we have been awarded “Best Unexpected View Restaurant” by Seattle’s WHERE MAGAZINE, and for obvious reasons. 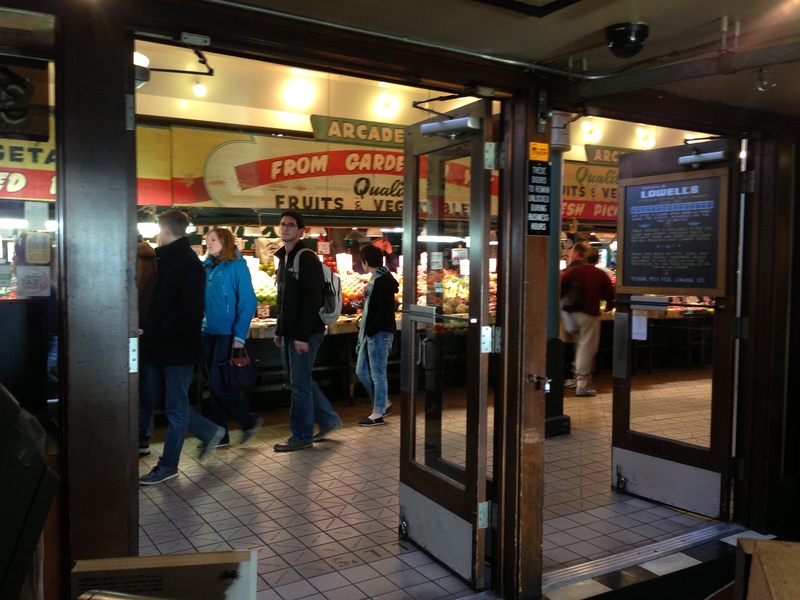 Looking into the arcade, or look into LOWELL’S from the arcade, who would imagine, unless you’re one of our many repeat visitors from around the world, daily locals or celebrities seeking a corner of privacy from the constant attention of recognition.